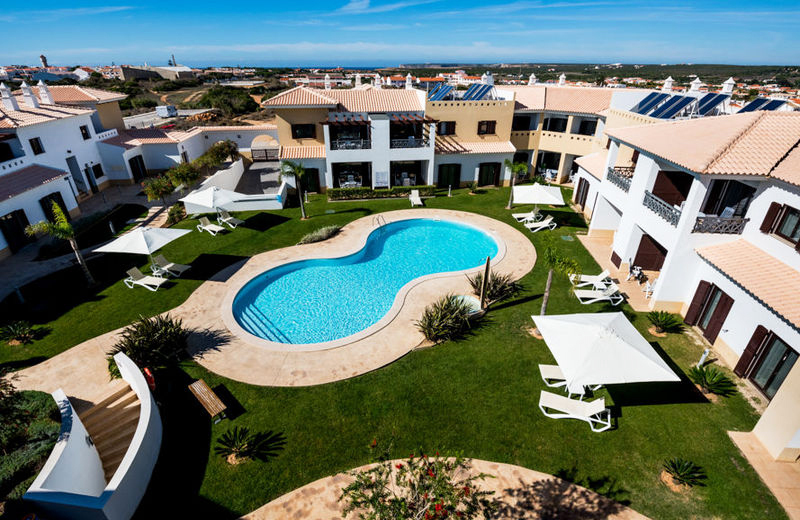 Cascais Beach Surf Camp - Cascais, Lisbon Guests overall rating: ★★★★★ 5 based on 2 reviews. We like to welcome our guests as close friends and we want to be a home for all who are visiting us. Our rules are like those from a house where a big family lives. Our team, besides being local to the area, are all very proud of their second home and love sharing their passion for Cascais, its stories and all their moments and experiences with our guests. Cascais is a typical coastal town with wonderful architecture, stunning beaches, and great surf points and one of the best places to indulge in delicious fresh fish and seafood dishes. It´s the perfect setting to get out and explore the old narrow streets of this historical town center. Enjoy a meal in our dining area or out in the garden and make sure to order a cocktail from our poolside bar where the magic happens! Private parking is not available but you can park on the main street free of charge. Unfortunately, pets are not allowed, excluding service animals. Reading lights, plugs and curtains on the bunks. 1 room with 4 beds, private bathroom and garden view. We provide the equipment (surfboard and wetsuit). You only need a beach towel, swimwear, sunscreen, and we recommend to keep a bottle of water with you. The surf lessons are always programmed to start the day after your arrival. We programmed our lessons every week according to the tide and conditions. We have the weekly schedule available every Sunday. For daily lessons – there are 2 surf sessions during high season and 1 lesson during the low and middle season. Hostel and Surf Camp: is situated only a short 5-minute walk from local supermarkets and the train station, which gets you to Lisbon in under 40 minutes. Restaurants, bars, and night-life are at 10 minutes walking distance from your house! 2. Leaving the train station in Cascais you need to take to the right and you will see the shopping center called Cascais Villa. 3. Cross the road, you will see the stairs to the bus station, before the entrance to the shopping center. 4. Cross the bus station under the shopping center and take right again. 5. As soon as you cross the road, you need to go up the street. 6. On the top of the street, turn left and you will see a wood and stone stairs in the middle of a small garden. 7. Go up and turn right. We are a 10-minute walk away from the train station. One way ticket is around €3. 1. Facing the exit of the buses from the station, turn right and cross the street. 2. As soon as you cross the road you need to go up the street. 3. On the top of the street, turn left and you will see a wood and stone stairs in the middle of a small garden. 4. Go up and turn right. We are in the middle of the street (Rua Tenente Coronel José Pessoa number 15- Pink house on the left side of the street). One way ticket is around €5. 1. Arriving by car in Cascais you will see on your left the train station and on the right Jumbo (supermarket). 2. On the first roundabout take the 1st exit-going up the street Avenida de Sintra. 3. You will face another roundabout, take the 3rd exit- left side. 4. 60 meters ahead there is a painted roundabout on the floor, is the 2nd exit (go straight). 5. You will see a garden which is a roundabout, is the 1st exit- right street: Rua Tenente Coronel José Pessoa. We are located in the curve, pink house on the left side of the street. We provide transfers from/to the Lisbon airport. It’s € 45 one way. To book we require the flight number, arrival hour in Lisbon airport and a phone number to contact you in case of delays. Please request your transfer with at least 48 hours in advance. ** Might be replaced by one double lesson instead of 2 depending on the wave and weather conditions. *** Only available with min 4pax/week. 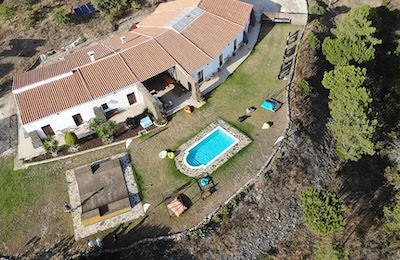 Taxes not included – occupancy tax 1.00 EUR per person per night until a maximum of 7 nights. "Stayed at Cascais Beach Surf Camp for 9 nights and I loved it! Great room with overlooking the swimming pool balcony! 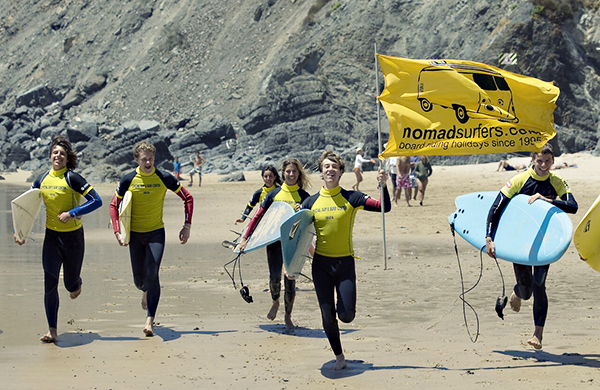 The location is great, surf lessons is good idea and staff is really helpful and nice. Highlight for dinners organized and drinks." 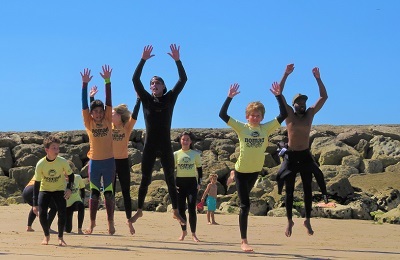 "The staff at Cascais Beach Surf Camp are very welcoming. Confortable and clean rooms,from the double ensuite room I could see pool , Garden and also the bay. Breakfast beside the pool by the sun was a great start for the day. Only 10 minutes walk to Cascais center, bus station, train station, great wifi fi. No issues, highly recommend. "